If you would like to find an affordable but professional moving company that is based in northern Utah, then consider Moving Connections. 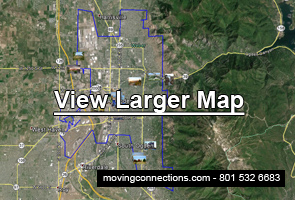 Moving Connections is a local, professional moving company serving Ogden and the Wasatch Front. We have been providing professional shipping and moving services for more than thirty years. And while we are local, cheerful, and friendly, we are also a top notch professional moving service that will deliver you a seamless transition to your new location. For instance, Moving Connections federally licensed with a federal Motor Carrier Number. We are also bonded and insured according to federal regulations. In keeping with that integrity, we also background check and drug test our employees. On top of that, we only hire employees who are experienced in the moving industry. In addition, Moving Connections has climate controlled storage facilities, plus conventional storage areas available for your convenience. With those qualifications, you might think that our rates are outrageous. But, in fact, we have very competitive rates that will stretch your budget dollars. And there are no hidden fees: you just pay for driving time, labor time, and boxes and tape. So you don’t end up with a bill that’s 50% higher than what you were quoted due to equipment rental, stretch wrap, padding fees, fuel surcharges, or non-existent taxes. You just pay for time, boxes, and tape. Moving Connections also offers a "labor only moving help" service in which you drive your own truck (usually a rental) and pack most of your household goods, which gives you savings on labor costs. Our Ogden moving crew just loads your items on the truck according to professional moving standards, plus they stretch wrap and blanket wrap and load all the heavy and bulky items, such as furniture, safes, and exercise equipment. Moving Connections also provides an excellent business moving service for those needing an office or corporate move. Moving Connections provides the premier local moving service for residents in the Ogden area. We are a federally licensed, bonded, and insured moving company that has been providing moving and shipping services in northern Utah for more than thirty years. We at Moving Connections are sensitive to the needs and values of Utah residents and so we strive to make every move a smooth transition to your new location. That’s why we hire only those individuals who are experienced in the moving industry. So you’re not paying for someone to learn the ropes “on the job.” These employees are also drug tested and background checked before they can work for us. Moving Connections has a transparent pricing policy in which you pay only for labor (driving time plus working time on site), plus the costs for boxes, tape, and packaging materials, minus stretch wrap, which is free. What you do not pay for are equipment rental, blanket and pad rental, stretch wrap, fuel surcharges, taxes, or any other “junk” fees. You just pay for time and packing materials that are actually used for your particular move. Moving Connections’ "labor only moving help" option is for those families or individuals who have a lot of household items, are confident in their packing skills, and who will rent or otherwise provide their own moving truck. If Moving Connections is moving you to Ogden it's a perfect time to begin to utilize the many resources and bounties of Ogden. For example click on the picture to the left to go the Moving Connections 'Support - Advice - Assistance' page and discover Ogden for the first time. Once you are on the 'Support - Advice - Assistance' page go ahead and open the .pdf link found there and tape the list of emergency and useful phone numbers on your refrigerator. Moving Connections has gone to great pains to find those links and connections to integrate you quickly into Ogden life. This leaves our Ogden moving team to take care of all the “hard stuff”, such as furniture, trampolines, pianos, and all the other heavy, bulky, or fragile items. These are best left to the professionals. So you do the packing and the driving, and we provide the “hard labor,” which is why we also call this “labor only” service. Moving Connections knows that business is what makes this country run. And that’s why we like to make certain that every office move and corporate relocation is a seamless transition. In fact, we like to coordinate with business owners and managers to keep your business up and running throughout the moving process. Because who needs “down” time? Moving Connections is experienced with simple local office moves from one floor to another in the same office building, as well as the complex, multi-day relocation of a corporation. So we bring to the table experienced crews who will be efficient and careful with your office equipment, machinery, computers, and files.